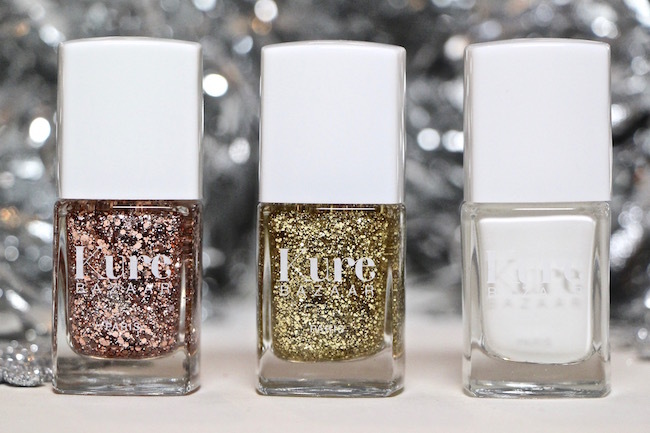 Finally, glittery nail polishes I can actually wear! I usually shun glitter because taking it off is one of the worst, most thankless beauty tasks ever invented. I would honestly rather go to the dentist than remove glitter polish. I’d rather wash up the trays and shelves from inside the oven, and we all know what a crap job that is. 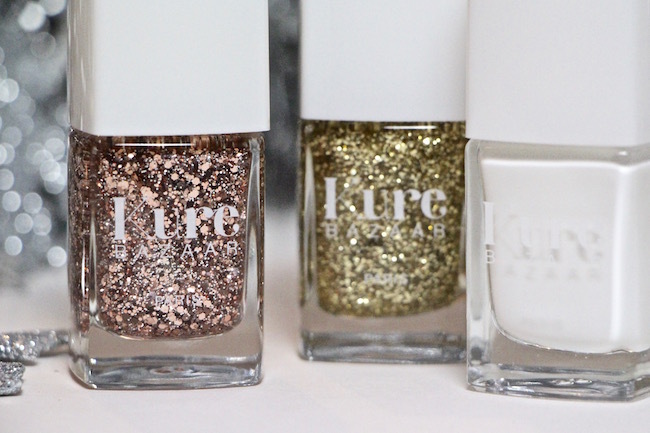 There are fifteen new glitter polishes from KURE – I have Diva, Precious and the special peel-off base coat. Precious (here) is a fine gold glitter and this looked brilliant after two coats – I expect it would look even more stunning over a metallic gold base or even a bright red base, but I was testing out over the peel-off. Still, it was incredibly sparkly and dense with glitter bits! 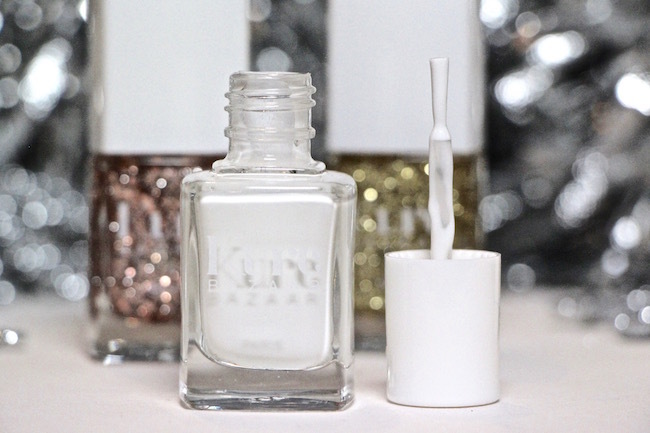 Diva is a chunkier, rose-gold glitter and looks really good, but I found it more difficult to build up than Precious, so I think that the finer glitters would be my choice. Comments Off on The Making of Majorette! First, we hunted down one of the masterminds behind it all: Cierra, a product development wizard. We know by now that nothing happens by mistake at Benefit—there’s always a backstory, and the story of majorette goes all the way back to our founding twins, Jean & Jane! The product development gals were digging around at Beauty Central, and spotted an old snapshot of young Jean & Jane dressed as majorettes. They got SO excited that they started marching around in an impromptu majorette routine (#lifeatbenefit), and they all got super-flushed from the excitement. Thus, the idea of majorette was born: an instant pep-up for your cheeks! Once the formula was developed, they moved into the art side of things. The packaging concept was simple for the artists: it simply had to be a majorette’s drum! They went for a vintage look, using the gold foil elements to glam it up, and chose to scallop the edges in that gorgeous coral to echo the shade of the blush within. We’re totally geeking out over our behind-the-scenes look at majorette, and we can’t wait to learn the backstory on more of our faves. What product do you want the behind-the-scenes scoop on? Let us know on Twitter @benefitbeauty! I’ll put my hands up straight away and say that on initial sight, I thought that the Eyeko Mascara Off Wipes were slightly pointless. What could they be doing that regular mascara remover doesn’t do? Eyeko Mascara Off Wipes come sachets, each one containing 10 wipes. The wipes are mini-sized, quite thick and feel much the same as any other premium wipe. I’m comparing to premium because some wipes are literally just a whisp of fabric that feel very flimsy. Eyeko Mascara Off Wipes do feel sturdy and more at the premium end. You hold the wipe to your lashes, keep it pressed in place for five seconds (I needed more) and the mascara just falls away onto the wipe. It’s that simple! I’ve used the wipes on my bottom lashes on Boots No.7 Stay Perfect Mascara which claims to be life-proof in terms of smudging, flaking, humidity and tears (and it’s my go-to for bottom lashes – lash extensions up top if you’re new to BBB) and the wipes made short work of it. My blurb says they contain aloe vera, olive oil, grapefruit extracts and allantoin and it’s very likely the olive oil that’s doing the work here. I’d suggest having a go with olive oil alone except you just know that’s going to lead to oily eye! For £6 a sachet, they’re well worth experimenting with, maybe for a weekend away when you need to travel light, but bottom line is that they work. The post Eyeko Mascara Off Wipes appeared first on British Beauty Blogger. So, it’s that awkward time between spring & summer. It’s definitely not hot enough to lay out by the pool, but I’m also not spending my weekends cooped up inside. Nothing says “let’s get away” like a quick weekend trip to the beach. But, unfortunately, nothing also says I’ve been “living under a rock in San Francisco” like my pasty skin. I’ve always been a little hesitant to get a airbrush tan—we’ve all seen the ‘orange’ effect, and that look doesn’t do anyone any good. But, you know what is good!? Learning that Benefit’s airbrush tans truly do provide an even color & a healthy glow to your whole body. Plus, the best part, each spray tan is custom-applied just for you. When you choose a shade 1-4, your aesthetician delicately and carefully applies the color on your skin with her spray gun. This instant beauty solution is the perfect way to prep for a vacation, an evening event or any occasion where you want to show off that skin! Off to the Benefit boutique I went to get my very first (like ever) airbrush tan! Exfoliate your entire body before going in for your tan to get super-even color. Wear loose-fit, dark clothing—you don’t want your tan to smudge on that white top! Getting your brows waxed and/or tinted? FYI: You’ll get your wax done first & your tint after. Make sure to shave the night before your tan. Do not use any lotion or oils on your body prior to your appointment! Wait 8-12 hours before showering, working out or swimming—you’ll want to maximize that bronze color! After you’ve showered, moisturize your face and body really well to show off that glow. Remember—don’t exfoliate until your tan starts to fade. Enjoy your new sun-kissed skin! My lovely aesthetician, Bella, asked how dark I wanted to go—you have a choice between: 1. hint of gold 2. sun-kissed 3. healthy glow & 4. deep. I went for the healthy glow; it’s been 6 days and I’m still looking glow-y! Other than stripping down to barely nothing, because whatever, I walked out of the boutique with fresh brows & a perfect glow. What more could you ask for on a Friday night?